It is quite easy under Windows 10, especially on the tablet, or desktop PC to set up a child login protection, if no password is used! PS: You must be logged in as an administrator to enable or disable this simple and easy child protection feature. 1.) ... Activating the simple child protection under Windows 10! 2.) ... Why the simple child protection under Windows 10? See also: ► Help, Windows 10 has no libraries, what am I doing wrong? 1.) Activating the simple child protection under Windows 10! 1. Windows + R 2. netplwiz 3. Advanced 4. 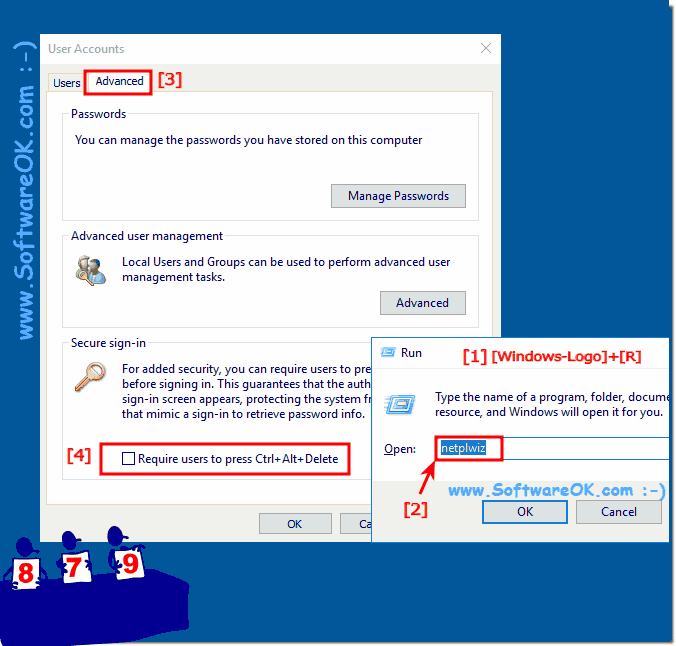 "Require user to press Ctrl + Alt + Delete"
(Image-1) Kids login protection under Windows 10! 2.) Why the simple child protection under Windows 10? This will ensure that if you are working without a Windows 10 password and the Windows 10 login screen appears, unlocking will only work by pressing Ctrl + Alt + Del, which is hard to understand for children up to a certain age. In this Windows 10 FAQ, you learned how to enable or disable simple child protection, so children on the lock screen must press Ctrl + Alt + Delete before they can access Windows as a solution suitable for Windows 10 ( Redstone 4 & 5) Pro, Enterprise, Home, Windows 8.1, Windows 8, Windows Server 2016, 2012, 2008, Windows 7 Basic, Professional, Starter, Ultimate. See also: ►►► Windows 10 user passwords via NET USER command ! You like to leave the Windows 10 tablet, or the Microsoft Surface on the table, or couch and just when you are working without a password on Windows 10, a small child protection is not so wrong. Here is a simple solution / example, how to set it up, is suitable for HOME and Professional version. Windows-10 - FAQ-219: Kids login protection under Windows 10 on tablet or desktop PC!